In fessing up to performance enhancing drug use, the cycling icon failed on form and content. Lance Armstrong’s much-ballyhooed “confessional” interview with Oprah Winfrey about his history of performance-enhancing drug use was an unmitigated disaster for the cycling icon in both form and content. In form, Armstrong was reptilian. His steely glare and cold and matter-of-fact tone about the false lawsuits he’d filed, the reputations he’d destroyed and the people he’d slandered was disturbing. If his goal by choosing Oprah was to appear sympathetic, it proved, at least for this viewer, to create the opposite effect. Oprah’s New Age glow acted as a harsh spotlight highlighting every flaw in the tenacious Texan’s salty demeanor. He also wanted to dispute the part of the report that makes him out to be the Tony Soprano of his cycling team: the facilitator of the PED intake of his riders and willing to bully, threaten or destroy anyone who stood up to him or threatened to blow the whistle. Armstrong was not just the star cyclist of his team but its boss: the man in charge, and USADA claims that he would destroy the careers of people who didn’t want to take part in his illegal ride. Armstrong’s claims that he didn’t do this were unconvincing. In content, Armstrong had two goals in this interview, and he failed on both in spectacular fashion. He needed to show the US Anti-Doping Agency that he was contrite, and he needed to make it clear that he accepted their findings. Ideally, if he did so, they would consider lifting his lifetime ban from competition. Oprah tried to help. Resembling a softball practice pitcher, she set him up repeatedly to be forthcoming and honest, and to humanize why he felt the need not just to use PEDs but attack anyone who dared get in his way. Yet despite her generous set-ups, Lance Armstrong whiffed time-and-again. It was like watching horribly mismatched dance partners: Ginger Rodgers arm-in-arm with Captain Kangaroo. To be clear, I don’t think Lance Armstrong is obligated to participate in this kabuki theater of contrition, but it’s gobsmacking why he would choose to sit on Oprah’s couch and not, as Oprah would say, “meet the moment.” If this was politics—and of course on one level it is—his handlers could be sued for malpractice. We will see in part two of the interview tonight whether or not Lance Armstrong shows contrition, remorse or a beating heart. If he doesn’t, this might be the end of Armstrong as a public figure in any meaningful sense beyond a cautionary tale. That would be a stunning result of the Oprah-effect. 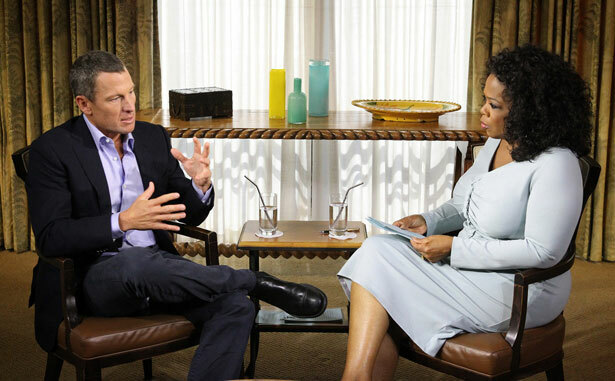 Check out Dave Zirin’s primer on Armstrong’s chat with Oprah.